As the periodic bloodshed continues in the Middle East, the search for an equitable solution must come to grips with the root cause of the conflict. The 'conventional' wisdom is that, even if both sides are at fault, the Palestinians are irrational "terrorists" who have no point of view worth listening to. However the Palestinians have a real grievance: their homeland for over a thousand years was taken, without their consent and mostly by force, during the creation of the state of Israel. And all subsequent crimes - on both sides - inevitably follow from this original injustice. This paper outlines the history of Palestine to show how this process occurred and what a moral solution to the region's problems should consist of. If you care about the people of the Middle East, Jewish and Arab, you owe it to yourself to read this account of the other side of the historical record. v. How long has Palestine been a specifically Arab country? vi. How did land ownership traditionally work in Palestine and when did it change? vii. Was Arab opposition to the arrival of Zionists based on inherent anti-Semitism? viii. Jews attitude towards Arabs when reaching Palestine.? ix. Proposals for Arab-Jewish Cooperation? x. Was Palestine the only, or even preferred, destination of Jews facing persecution when the Zionist movement started? ii. Wasn't Palestine a wasteland before the Jews started immigrating there? iii. Were the early Zionists planning on living side by side with Arabs? iv. Given Arab opposition to them, did the Zionists support steps towards majority rule in Palestine? viii. Didn't the Zionists legally buy much of the land before Israel was established? i. Why did the UN recommend the plan partitioning Palestine into a Jewish and an Arab state? ii. Why was this Truman's position? iii. Was the partition plan fair to both Arabs and Jews? iv. Were the Zionists prepared to settle for the territory granted in the 1947 partition? v. Public vs private pronouncements on this question. x. Was Deir Yassin the only act of its kind? i. What was the Arab reaction to the announcement of the creation of the state of Israel? ii. Was the part of Palestine assigned to a Jewish state in mortal danger from the Arab armies? iv. Didn't the Palestinians leave their homes voluntarily during the 1948 war? vii. After the fighting was over, why didn't the Palestinians return to their homes? viii. Is there any justification for this expropriation of land? ix. How about the negotiations after the 1948-1949 wars? xi. What was the fate of the Palestinians who had now become refugees? i. Did the Egyptians actually start the 1967 war, as Israel originally claimed? iii. But wasn't the occupation of Arab lands necessary to protect Israel's security? iv. What happened after the 1967 war ended? v. World opinion on the legality of Israeli control of the West Bank and Gaza. vii. All Jewish settlements in territories occupied in the 1967 war are a direct violation of the Geneva Conventions, which Israel has signed. ix. Jerusalem - Eternal, Indivisible Capital of Israel? i. We hear lots about Palestinian terrorism. How about the Israeli record? v. "It is no longer my country"
vi. The effect of Zionism on American Jews. The problem with this explanation is that it is simply not true, as the documentary evidence in this booklet will show. What really happened was that the Zionist movement, from the beginning, looked forward to a practically complete dispossession of the indigenous Arab population so that Israel could be a wholly Jewish state, or as much as was possible. Land bought by the Jewish National Fund was held in the name of the Jewish people and could never be sold or even leased back to Arabs (a situation which continues to the present). One further point: being Jewish ourselves, the position we present here is critical of Zionism but is in no way anti-Semitic. We do not believe that the Jews acted worse than any other group might have acted in their situation. The Zionists (who were a distinct minority of the Jewish people until after WWII) had an understandable desire to establish a place where Jews could be masters of their own fate, given the bleak history of Jewish oppression. Especially as the danger to European Jewry crystalized in the late 1930’s and after, the actions of the Zionists were propelled by real desperation. But so were the actions of the Arabs. The mythic “land without people for a people without land” was already home to 700,000 Palestinians in 1919. This is the root of the problem, as we shall see. i. Before the Hebrews first migrated there around 1800 B.C., the land of Canaan was occupied by Canaanites. vii. Was Arab opposition to the arrival of Zionists based on inherent anti-Semitism or a real sense of danger to their community? viii. Jews attitude towards Arabs when reaching Palestine. “The pogroms forced many Jews to leave Russia. Societies known as ‘Lovers of Zion,’ which were forerunners of the Zionist organization, convinced some of the frightened emigrants to go to Palestine. There, they argued, Jews would rebuild the ancient Jewish ‘Kingdom of David and Solomon,’ Most Russian Jews ignored their appeal and fled to Europe and the United States. By 1900, almost a million Jews had settled in the United States alone.” “Our Roots Are Still Alive” by The People Press Palestine Book Project. i. The Balfour Declaration promises a Jewish Homeland in Palestine. ii. Wasn’t Palestine a wasteland before the Jews started immigrating there? “If [the] principle [of self-determination] is to rule, and so the wishes of Palestine’s population are to be decisive as to what is to be done with Palestine, then it is to be remembered that the non-Jewish population of Palestine — nearly nine-tenths of the whole — are emphatically against the entire Zionist program.. To subject a people so minded to unlimited Jewish immigration, and to steady financial and social pressure to surrender the land, would be a gross violation of the principle just quoted...No British officers, consulted by the Commissioners, believed that the Zionist program could be carried out except by force of arms.The officers generally thought that a force of not less than fifty thousand soldiers would be required even to initiate the program. That of itself is evidence of a strong sense of the injustice of the Zionist program...The initial claim, often submitted by Zionist representatives, that they have a ‘right’ to Palestine based on occupation of two thousand years ago, can barely be seriously considered.” Quoted in “The Israel-Arab Reader” ed. Laquer and Rubin. “Palestine belongs to the Arabs in the same sense that England belongs to the English or France to the French...What is going on in Palestine today cannot be justified by any moral code of conduct...If they [the Jews] must look to the Palestine of geography as their national home, it is wrong to enter it under the shadow of the British gun. A religious act cannot be performed with the aid of the bayonet or the bomb. They can settle in Palestine only by the goodwill of the Arabs... As it is, they are co-sharers with the British in despoiling a people who have done no wrong to them. I am not defending the Arab excesses. I wish they had chosen the way of non-violence in resisting what they rightly regard as an unacceptable encroachment upon their country. But according to the accepted canons of right and wrong, nothing can be said against the Arab resistance in the face of overwhelming odds.” Mahatma Gandhi, quoted in “A Land of Two Peoples” ed. Mendes-Flohr. viii. Didn’t the Zionists legally buy much of the land before Israel was established? “In 1948, at the moment that Israel declared itself a state, it legally owned a little more than 6 percent of the land of Palestine...After 1940, when the mandatory authority restricted Jewish land ownership to specific zones inside Palestine, there continued to be illegal buying (and selling) within the 65 percent of the total area restricted to Arabs. ii. Why was this Truman’s position? “I am sorry gentlemen, but I have to answer to hundreds of thousands who are anxious for the success of Zionism. I do not have hundreds of thousands of Arabs among my constituents.” President Harry Truman, quoted in “Anti Zionism”, ed. by Teikener, Abed-Rabbo & Mezvinsky. “While the Yishuv’s leadership formally accepted the 1947 Partition Resolution, large sections of Israel’s society — including...Ben-Gurion — were opposed to or extremely unhappy with partition and from early on viewed the war as an ideal opportunity to expand the new state’s borders beyond the UN earmarked partition boundaries and at the expense of the Palestinians.” Israeli historian, Benny Morris, in “Tikkun”, March/April 1998. “In December 1947, the British announced that they would withdraw from Palestine by May 15, 1948. Palestinians in Jerusalem and Jaffa called a general strike against the partition. Fighting broke out in Jerusalem’s streets almost immediately...Violent incidents mushroomed into all-out war...During that fateful April of 1948, eight out of thirteen major Zionist military attacks on Palestinians occurred in the territory granted to the Arab state.” “Our Roots Are Still Alive” by the People Press Palestine Book Project. “The Arab League hastily called for its member countries to send regular army troops into Palestine. They were ordered to secure only the sections of Palestine given to the Arabs under the partition plan. But these regular armies were ill equipped and lacked any central command to coordinate their efforts...[Jordan’s King Abdullah] promised [the Israelis and the British] that his troops, the Arab Legion, the only real fighting force among the Arab armies, would avoid fighting with Jewish settlements...Yet Western historians record this as the moment when the young state of Israel fought off “the overwhelming hordes’ of five Arab countries. In reality, the Israeli offensive against the Palestinians intensified.” “Our Roots Are Still Alive,” by the Peoples Press Palestine Book Project. iv. Didn’t the Palestinians leave their homes voluntarily during the 1948 war? “Israeli propaganda has largely relinquished the claim that the Palestinian exodus of 1948 was ‘self-inspired’. Official circles implicitly concede that the Arab population fled as a result of Israeli action — whether directly, as in the case of Lydda and Ramleh, or indirectly, due to the panic that and similar actions (the Deir Yassin massacre) inspired in Arab population centers throughout Palestine. However, even though the historical record has been grudgingly set straight, the Israeli establishment still refused to accept moral or political responsibility for the refugee problem it — or its predecessors — actively created.” Peretz Kidron, quoted in “Blaming the Victims,” ed. Said and Hitchens. “During May  ideas about how to consolidate and give permanence to the Palestinian exile began to crystallize, and the destruction of villages was immediately perceived as a primary means of achieving this aim...[Even earlier,] On 10 April, Haganah units took Abu Shusha... The village was destroyed that night... Khulda was leveled by Jewish bulldozers on 20 April... Abu Zureiq was completely demolished... Al Mansi and An Naghnaghiya, to the southeast, were also leveled. . .By mid-1949, the majority of [the 350 depopulated Arab villages] were either completely or partly in ruins and uninhabitable.” Benny Morris, “The Birth of the Palestinian Refugee Problem, 1947-1949.
vii. After the fighting was over, why didn’t the Palestinians return to their homes? “The winter of 1949, the first winter of exile for more than seven hundred fifty thousand Palestinians, was cold and hard...Families huddled in caves, abandoned huts, or makeshift tents...Many of the starving were only miles away from their own vegetable gardens and orchards in occupied Palestine — the new state of Israel...At the end of 1949 the United Nations finally acted. It set up the United Nations Relief and Works Administration (UNRWA) to take over sixty refugee camps from voluntary agencies. It managed to keep people alive, but only barely.” “Our Roots Are Still Alive” by The Peoples Press Palestine Book Project. iii. But wasn’t the occupation of Arab lands necessary to protect Israel’s security? “Senator [J.William Fulbright] proposed in 1970 that America should guarantee Israel’s security in a formal treaty, protecting her with armed forces if necessary. In return, Israel would retire to the borders of 1967. The UN Security Council would guarantee this arrangement, and thereby bring the Soviet Union — then a supplier of arms and political aid to the Arabs — into compliance. As Israeli troops were withdrawn from the Golan Heights, the Gaza Strip and the West Bank they would be replaced by a UN peacekeeping force. Israel would agree to accept a certain number of Palestinians and the rest would be settled in a Palestinian state outside Israel. “In violation of international law, Israel has confiscated over 52 percent of the land in the West Bank and 30 percent of the Gaza Strip for military use or for settlement by Jewish civilians...From 1967 to 1982, Israel’s military government demolished 1,338 Palestinian homes on the West Bank. Over this period, more than 300,000 Palestinians were detained without trial for various periods by Israeli security forces. “Intifada: The Palestinian Uprising Against Israeli Occupation,” ed. Lockman and Beinin. “A summer trip to a Jewish settlement on the edge of the Judean desert less than five miles from Bethlehem confirmed this water inequity for us. While Bethlehemites were buying water from tank trucks at highly inflated rates, the lawns were green in the settlement. Sprinklers were going at mid day in the hot August sunshine. Sounds of children swimming in the outdoor pool added to the unreality.” Betty Jane Bailey, in “The Link”, December 1996. “There is nothing quite like the misery one feels listening to a 35-year-old [Palestinian] man who worked fifteen years as an illegal day laborer in Israel in order to save up money to build a house for his family only to be shocked one day upon returning from work to find that the house and all that was in it had been flattened by an Israeli bulldozer. When I asked why this was done — the land, after all, was his — I was told that a paper given to him the next day by an Israeli soldier stated that he had built the structure without a license. Where else in the world are people required to have a license (always denied them) to build on their own property? Jews can build, but never Palestinians. This is apartheid.” Edward Said, in “The Nation”, May 4, 1998.
iv. 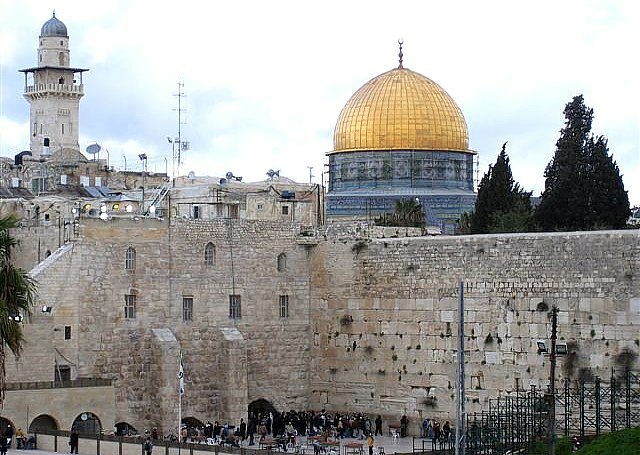 Jerusalem — Eternal, Indivisible Capital of Israel? “Writing in The Jerusalem Report (Feb. 28, 2000), Leslie Susser points out that the current boundaries were drawn after the Six-Day War. Responsibility for drawing those lines fell to Central Command Chief Rehavan Ze’evi. The line he drew ‘took in not only the five square kilometers of Arab East Jerusalem — but also 65 square kilometers of surrounding open country and villages, most of which never had any municipal link to Jerusalem. Overnight they became part of Israel’s eternal and indivisible capital.’” Allan Brownfield in The Washington Report On Middle East Affairs, May 2000. Egypt and Syria continued to demand the return of the land taken by Israel in 1967. However, attempts at diplomacy failed, and eventually Egyptian President Anwar Sadat warned that war would come if Israel did not return Egypt's Sinai Peninsula and Syria's Golan Heights. But Kissinger and the Israelis dismissed him, as did the US media. Israel had considered its position unassailable, but a brilliant strategy known as "Operation Badr" resulted in a stunning success. Egyptian planners had feared that the attack might cost as many as 30,000 casualties, but at the end of October 6, Egyptian losses were only 208 dead. As military historian Trevor N. Dupuy summed up: "The combination of thorough and efficient planning, careful security, the achievement of complete surprise, and the highly efficient execution of carefully prepared plans, resulted in one of the most memorable water crossings in the annals of warfare. As with the planning, no other army could have done better." By 12 October, Israeli Ambassador Simcha Dinitz bluntly warned Kissinger that "if a massive American airlift to Israel does not start immediately then I'll know that the United States is reneging on its promises and its policy, and we will have to draw very serious conclusions from all this." Kissinger's biographers, Bernard and Marvin Kalb, observed of this remark: "Dinitz did not have to translate his message. Kissinger quickly understood that the Israelis would soon 'go public' and that an upsurge of pro-Israeli sentiment could have a disastrous impact upon an already weakened administration. When on 18 October Nixon attempted to appease Israel's clamoring supporters even further by requesting from Congress $2.2 billion in emergency aid for Israel, Saudi Arabia and other oil producing states finally imposed a total oil boycott agasint the United States in retaliation for its unlimited support of Israel. Kissinger estimated that the direct costs to the United States were $3 billion and the indirect costs, mainly from higher prices of oil, $10 billion to $15 billion. He added: "It increased our unemployment and conributed to the deepest recession we have had in the post war period." This was a high price to pay for a country that was supposed to enhance US interests. * From FALLEN PILLARS: U.S. Policy towards Palestine and Israel since 1945 and WARRIORS AGAINST ISRAEL: How Israel Won the Battle to Become America's Ally 1973, both by Donald Neff. Donald Neff, author of five books about the Israeli-Palestinian conflict, was a Middle East correspondent for the Los Angeles Times before becoming Jerusalem Bureau Chief and Senior Editor for Time magazine. His book Warriors at Suez, the first of his Warriors trilogy on America's relations with the Middle East and Israel, was nominated for the American Book Award in 1981 in the history category and was an alternate selection of both the Book of the Month Club and the History Book Club. More on the oil boycott. Editor’s Note: We believe that the killing of innocent people is wrong, in all cases. Thus, we cannot condone the use of terrorism by some extreme Palestinian groups, especially prevalent during the 1970s. That being said, however, it is necessary to examine the context in which such incidents occurred. “The record of Israeli terrorism goes back to the origins of the state — indeed, long before — including the massacre of 250 civilians and brutal expulsion of seventy thousand others from Lydda and Ramle in July 1948; the massacre of hundreds of others at the undefended village of Doueimah near Hebron in October 1948;...the slaughters in Quibya, Kafr Kassem, and a string of other assassinated villages; the expulsion of thousands of Bedouins from the demilitarized zones shortly after the 1948 war and thousands more from northeastern Sinai in the early 1970’s, their villages destroyed, to open the region for Jewish settlement; and on, and on.” Noam Chomsky, “Blaming The Victims,” ed. Said and Hitchens. “However much one laments and even wishes somehow to atone for the loss of life and suffering visited upon innocents because of Palestinian violence, there is still the need, I think, also to say that no national movement has been so unfairly penalized, defamed, and subjected to disproportionate retaliation for its sins as has the Palestinian. “It is simply extraordinary and without precedent that Israel’s history, its record — from the fact that it..is a state built on conquest, that it has invaded surrounding countries, bombed and destroyed at will, to the fact that it currently occupies Lebanese, Syrian, and Palestinian territory against international law — is simply never cited, never subjected to scrutiny in the U.S. media or in official discourse...never addressed as playing any role at all in provoking ‘Islamic terror.’” Edward Said in “The Progressive.” May 30, 1996. “A Jewish Home in Palestine built up on bayonets and oppression [is] not worth having, even though it succeed, whereas the very attempt to build it up peacefully, cooperatively, with understanding, education, and good will, [is] worth a great deal even though the attempt should fail.” Rabbi Judah L. Magnes, first president of the Hebrew University in Jerusalem, quoted in “Like All The Nations?”, ed. Brinner & Rischin. “The first fact is that at the time when we entered into an alliance (an alliance, I admit, that was not well defined) with a European state and we provided that state with a claim to rule over Palestine, we made no attempt to reach an agreement with the Arabs of this land regarding the basis and conditions for the continuation of Jewish settlement. This negative approach caused those Arabs who thought about and were concerned about the future of their people to see us increasingly not as a group which desired to live in cooperation with their people but as something in the nature of uninvited guests and agents of foreign interests (at the time I explicitly pointed out this fact). “The second fact is that we took hold of the key economic positions in the country without compensating the Arab population, that is to say without allowing their capital and their labor a share in our economic activity. Paying the large landowners for purchases made or paying compensation to tenants on the land is not the same as compensating a people. As a result, many of the more thoughtful Arabs viewed the advance of Jewish settlement as a kind of plot designed to dispossess future generations of their people of the land necessary for their existence and development. Only by means of a comprehensive and vigorous economic policy aimed at organizing and developing common interests would it have been possible to contend with this view and its inevitable consequences. This we did not do. The Myth of Arab Intransigence — [The U.N.] convened a peace conference in Lausanne, Switzerland in the spring of 1949. Before the conference, the U.N. General Assembly adopted a resolution that in effect replaced the November 1947 partition resolution. This new resolution, Resolution 194 of December 11, 1948, accepted [U.N. Mediator] Bernadotte’s triangular basis for a comprehensive peace: an unconditional return of all the refugees to their homes, the internationalization of Jerusalem, and the partitioning of Palestine into two states. This time, several Arab states and various representatives of the Palestinians accepted this as a basis for negotiations, as did the United States, which was running the show at Lausanne...Prime Minister David Ben Gurion strongly opposed any peace negotiations along these lines...The only reason he was willing to allow Israel to participate in the peace conference was his fear of an angry American reaction...The road to peace was not taken due to Israeli, not Arab, intransigence. iv. Conclusions — The new Israeli historians...wish to rectify what their research reveals as past evils...There was a high price exacted in creating a Jewish state in Palestine. And there were victims, the plight of whom still fuels the fire of conflict in Palestine.” Israeli historian, Ilan Pappe in “The Link”, January, 1998. “For me, this business called the state of Israel is finished...I can’t bear to see it anymore, the injustice that is done to the Arabs, to the Beduins. All kinds of scum coming from America and as soon as they get off the plane taking over lands in the territories and claiming it for their own...I can’t do anything to change it. I can only go away and let the whole lot go to hell without me.” Israeli actress (and household name) Rivka Mitchell, quoted in Israeli peace movement periodical, “The Other Israel”, August 1998. “The corruption of Judaism, as a religion of universal values, through its politicization by Zionism and by the replacement of dedication to Israel for dedication to God and the moral law, is what has alienated so many young Americans who, searching for spiritual meaning in life, have found little in the organized Jewish community.” Allan Brownfield, “Issues of the American Council for Judaism”, Spring 1997.